Background is called the matrix of a painting. Something that holds the foreground or main subject to our focus. Even though, we often neglect this stepping stone. And this element should be discussed separately because this the principle step that even comes before the composition sometimes. If you have nothing to hold it, what fate becomes of your precious creation? Before we analyze the elements of a background, we must understand what is background actually. Background is not a solid object or patch of colour which you must put behind your painting to support it. No. Background is the space that surrounds your painting. It is the only way with which your painting relates to the surrounding at the very first place. It is where your sight is tricked into distance. While we are talking about backgrounds, we should introduce the terms of positive and negative spaces. Positive space is simply the thing you are painting, where negative space is the space between the object and the rest of the scene. 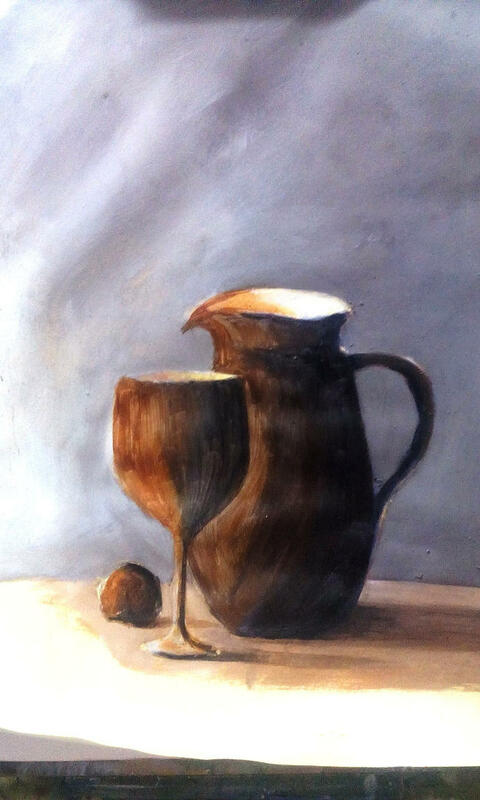 In an example, if you are painting a jug - the jug itself is a positive space, where the part of the wall that is being seen through the hole of jug's handle is negative space, which is a sole part of the background. Negative space is what shapes the object in focus, i.e. foreground object. But that does not mean background is negative space and vice versa. Background a is a bigger thing. Negative space is a part of it. Better said, a working hand. Negative space gives a shape to your object. Think like, the space around the object is another object which you painted, resulting in the shaping of a hole in middle which you will fill with paints. If there is no background, you can not shape your object. 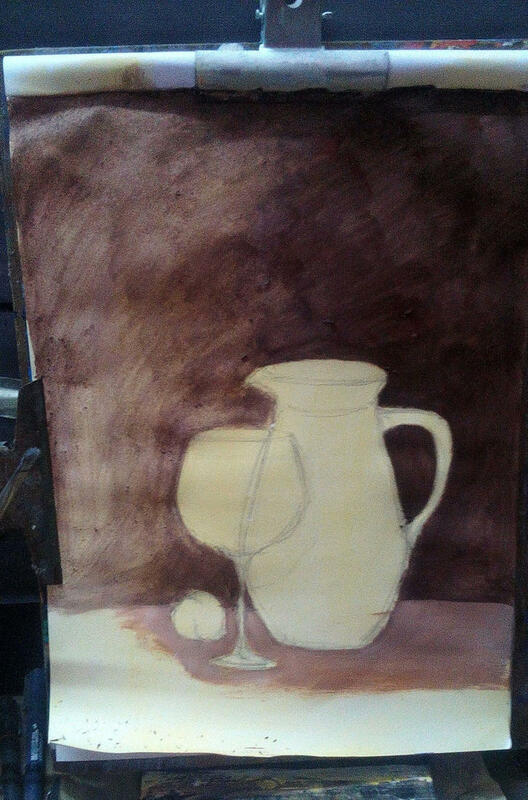 You may think that if you just paint an object and introduce no background, where is the need of it? Well, you are drawing/painting on a surface which has a single colour, mostly white. Now your drawing on that surface can be simply explained as repainting the hole we mentioned before - the negative space and the hole it created has the same colour - so you can not distinguish them and hence you simply defined the edges with lines and recoloured, having the impression that there were never any background! It may sound brain-melting, but that is how it really is. Notice how the background is shaping the foreground. I mentioned in previous articles, there is no lines in reality. We use lines to define the edges - edges that are created at the point of two matters meeting or overlapping. The matter in the back gives the shape to the matter in the front. If they are indistinguishable for hues, lights or anything, then we introduce lines to define them. So you see, that no foreground can exist alone without a background. Back to the painting on a white background - is a plain bad choice. Specially for amateurs. Skilled and professional artists who has a clear and vast sense of contrasts and spaces, can paint on any surface. Not only you are making the background boring by a single patch of colour, also pushing your object into the background like the white is engulfing it instead of shaping it. Same with using other colours plain as background. They are boring as well, just they do not engulf your foreground. Also unrealistic and if put randomly, then a perfect painting destroyer. If we think and imagine - can an object have lights all over it equally, unless it is itself is emitting light? No, right? Same with the backgrounds. How can they be defined with just one patch of colour without any shades or values? There are differences of backgrounds, but for the sake of understanding, we can think it as the wall behind your object. If you use a one-sourced light, the wall will have its own shadowy and lightened part. Establishing that difference of light will only bring forth your foreground more prominently and with a sense of reality. So it is worth enough. The wall is a sole part of background in this particular painting. But it got its share of lights and shades. That's very important, because background is not just a supporting element. It's a missing piece of the puzzle. Without it, the painting will not be completed. The importance of backgrounds can be realized very well while painting still lives. Because there we paint it as its simplest form - as another object. (This is the part where artists talk about 'the big picture'. Considering the entire subject as an object instead of putting details to individual things.). There we have not much visual trickery to imitate depth, not much gathering of many objects, and thus not much colours to confuse ourselves. Hence the wall behind the still life object is a perfect example of simple background. However, there is non-negligible space between the wall and the object but that as not as vast as in a landscape, and can be established easily. Now, what is our priority? The foreground of course. The background is the only way to shape it. So if we need to draw focus on the foreground, we need to work on the thing that shaped it. If you paint your background and foreground with same hue, there will be no contrast, hence no focus and no interest. You need to choose your background colour very wisely, analyzing what possibly can bring forth your prioritized object. It is like wearing the proper tie. For example, a neutral hue an define the the shape of your object in foreground very well because there is nothing to clash with. A light neutral for a darker background, or a dark neutral for a lighter background. The second one is the most practiced approach, as because dark tones defines things prominently without reflecting lights. Darker background for lighter objects and lighter background for darker objects. To bring variety, one may choose the complementary colours to create a High contrast and draw focus that way. For example, a cerulean blue vases infront of a lemony yellow wall would come forward striking! Cerulean blue, Prussian blue, Phthalo blue and their kinds are stronger than yellow. One may use a stronger yellow for background like a Cadmium yellow or a darker yellow-earth like Yellow Ochre, but those strong blues will overpower them anyways - just using so much strong yellow will cause unnecessary disturbance in the painting. If you are painting fro real life, you need to organize your setup wisely, considering the object and the wall and the light etc. Similarly, a pale but contrasting background brings forth the darker and stronger foreground. As example : red foreground on a pale blue background. Here the entire light blue sky, which acts as the background and also complementary colour, supports the dark red foreground to just pop out! Some artists establish a highly decorated backgrounds with drapes and etc and place a simpler objects in foreground. Thus such objects creates an effect like isolated contrast. The viewer's eyes will go on the simpler object in a background with overly decorated items - creating a successful paintings. Another example that comes in my mind at once is Karen Budan's 'Reflections of Red'. I don't know any source form where I can copy the link of the work legally, so I can not show the example. Just Google it. It is a silverware in font of a decorated drape. Now, for landscapes or wherever the depth of space is too vast: where the background is established to to trick our sights into thinking of distance, the rules of background are different, slightly. Because these elements define depth. The background in an open space is like a missing piece of jigsaw puzzle. It has no exact position to be exact, but it must fit to your foreground to give it the complete look. Perspective: We have talked a lot about perspectives and there are a great deal of tutorials on deviantART to clear you the idea of perspective. So there is nothing new to tell about perspective. Only I must say, that you must treat perspective as a wire-frame model; and you need to put elements on it create depth. Along a perspective can not invoke the feeling of life, in this case realism. Hue: The distant objects often reflects as a different colour specially if the objects are white in real. Best example is a mountain. Mountains' tops are mostly snow covered and thus white. From a great distance, the lights reflects almost totally on a white surface and as that reflected light passes through various layers in our surround atmosphere, some parts of the lights are absorbed in those layers by dust particles, gas particles etc. At the end, the wavelength of the reflected light reaches our eyes, we see that colour that bears that wavelength. Mostly it is blue, because blue light scatters most than any other wavelengths of lights. That is why we see the sky blue and that is why we don't see the Sun blue! (Sun is the prime source of light at day time. Its blue lights scatter far away before reaching our eyes, where only red and yellow reaches our sight. Due to the scattering, the particles in air reflects it all around - for the reason we see the sky blue). Here we must talk about the various colours of the sky because when you see upward from the horizon, you will see the sky changing colours from dark red to red to yellow to slight greenish to blue and purple and darker and darker above that (because of the absence of dust particles above troposphere). Establishing these colours correctly will give the distant feeling of the sky like a dome that is covering us. Also the foreground should be warm coloured and as the distance increases, the background should be colder and colder in hues' temperature. Cooler hues give the feeling of distance. Values: The values decreases to light as far as the scene goes. The objects gets paler and paler until you can't see anything else anymore. By making the distant objects lighter in value will succeed you in creating the illusion of depth. Intensity: This one is similar to values. The nearest object will be more darker in tone, more saturated in hue; but as the distance grows, they tends to 'fade away', and thus the colour intensity decreases. Saturated and secondary colours degrades to less saturated hues and in primary colours. The Hue+value+Intensity creates a very real like imitation of depth and distance. 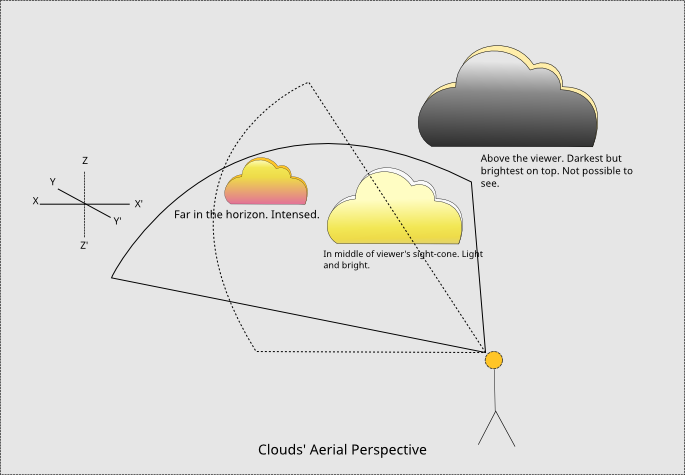 The application of these three together is called Aerial Perspective. 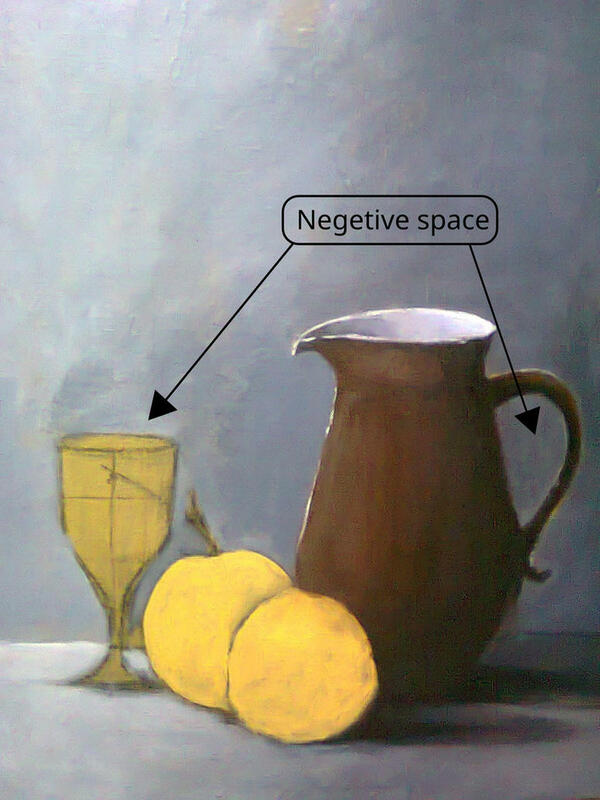 Placement of objects: To depict depth, you must do some overlapping in the distant objects. This is actually depicting the narrow vision. Also the objects should be less and less detailed and textures as far as it goes than the nearer ones. And for the weight, if the scene is considered a 3D box, the bigger and heavier object will be far from the centre and the smaller will be closer to the centre, have the impression of exact opposite. i.e. Bigger will look smaller and smaller will look bigger, because sitting in foreground. The bigger is the object the more it should be overlapped by other objects and sit farthest. This does not only creates the sense of weight, but also the sense of distance. While painting landscapes, most of the beginners paint all the clouds in same values and hues. Not only the clouds look flat, but they also look like they are floating in a same surface or layer marching one behind another. But in reality, the clouds are scattered here and there in the sky, going further away in distance. They are never on same surface. The funny thing with clouds is that, to define these depth and distances in clouds, all the above mentioned rules flip upside down. The rules are opposite for clouds. They gets darker and darker as far they go and lighter as near they come. Also the hues change intensity as they go further in distance. But the clouds that are so near you like they are almost above your eyes and thus missing the cone of your sight, will be darker again. This makes the clouds near about in the middle to be lightest. Famous painter John Constable was a master in cloud studies. He made numerous paintings to study the clouds. Match the diagram with the painting above. Detailing is a thing that clashes with background rules a lot. 'Normally', the background should have less details, but the artist can keep a great deal of details and also make the background contrasting with the foreground with proper placing of elements, and lights. 'Las Meninas' by Diego Velázquez is one of the most important paintings in Western art history. It shows how much details an artist can put while still having every other elements of composition precisely. So treat the background with respect. It is the matrix of your painting. The womb where your painting may grow. Take care of it before everything and all will be well. If you have found the articles helpful, head over to my Facebook page and show your appreciation. I think you already did that. Great article! Was helpful a lot ! I never knew what was aerial perspective! The examples are awesome! Great work put on! Glad to know it was helpful. Fantastic! I hate backgrounds because I never know how to do them correctly; from a while I've know the backgrounds are a key part in the whole work, but I had no idea what was the right way to do them so I'm returning to this article several times. I'm more in human drawing, portraits and all that, the same principles apply for them, I suppose. Quite true. Mostly for portraits, the background is a solid one, in most cases. In those cases, they are treated similar as in any other still life. If the portrait is outside, one seldom will need to establish the entier background. Studying of portrait photographs are very useful in this case. And if the portrait has abstract background, one needs to make it contrasting to the foreground as well as contrasting to the lights. There is no genre like human drawing. Artists do those to practice human anatomy to apply somewhere else, in other paintings or drawings - even so, they practice the other elements like the seat of the model, the drape behind the model and the wall and most importantly lights. I didn't recieve your answer! Just because I'm re-reading the article I realized you responded me. Well, I'm struggling with backgrounds right now so let's see how it goes. I like your articles, so well explained and full of useful info. Thanks! I am usually very lazy with my backgrounds but next time I draw, I'll keep this article in my mind. I'm glad to know you found it informative. Well backgrounds are still BACKground, so unless you are a master realistic painter, I don't think one should put much effort to it. Just we need to put effort on establishing an appropriate background. Which makes sense. Which relates to the foreground in almost every possible way. Not much need of being detailed or something. See Frans Koppelaar's painting. The background is not detailed but it's appropriate and relates to the foreground and doesn't seem unnatural. Great article, lots of helpful info here. I had actually never noticed that about clouds! It probably explains why I just never seem to get them right. Pretty much gave up on trying to make them look like anything more than "just like clouds", but now that I've read that nifty little part, I definitely have a better understanding of what I've been doing wrong. Yes clouds are pretty tricky but not impossible. There is an easy method of painting clouds (semi-realistically though) by using your thumb. I tried that once or twice and the result came satisfactory. Have you seen the paintings of Arnold Lowrey? In his books, he often suggested painting the clouds with one's thumb. You can read his books in spare time. If you are having a trouble establishing satisfactory backgrounds and if you paint landscapes, I will suggest that you do some real life study from real scenes or photographs. See how it is in the farthest and try to replicate it. After doing a lot of real life studies, you brain will have enough data to construct an appropriate background for your imaginary scene. Also note that backgrounds shape the foreground - true but foregrounds also need to relate to the backgrounds. For example. If the background is dark, the foreground can't be so bright either. They need to relate as well as contrast to be distinguishable. I will have to try that out whenever I get my paints out again, I'm mainly a colored pencil artist, so using my thumb for clouds won't do me much good It does seem like a neat technique! That's exactly my problem, I need to make a lot of background studies and draw from photos and such, because not only will that help me improve, but it will also expand my horizons. The problem there mainly lies in laziness though, which is easily fixed anyway. I've always been more inclined to draw from my mind than from real life/references, so I get easily bored when I have to base what I'm drawing off of something else other than what's floating around in my imagination. That makes it so that many times, I'd just rather slap in a generic looking background just so I don't have my subject hanging on empty space, instead of actually putting effort and thought into the scenery. This article really makes me want to break out of that habit though and drive myself to improve on my backgrounds, which is something I've been meaning to do for some time now, so I really have to thank you for that. You are welcome keep up practicing and experimenting ! In last Traditional Week, we talked about the elements which if you ignore can destroy your painting and all your hardwork. Contrast and Values were one main element that either can make your works fruitful or ruin it. It needs to be discussed more broadly as a lot of new artists have trouble to establish a good tonal contrast. Result? Despite their brilliant artistic skills, the picture does not pop up! It looks dull, muted. That is not the fault of the drawing or skills, it's the lack of observation and understanding lights. A still life is a work of art depicting mostly inanimate subject matter, typically commonplace objects which may be either natural (food, flowers, dead animals, plants, rocks, or shells) or man-made (drinking glasses, books, vases, jewelry, coins, pipes, and so on). 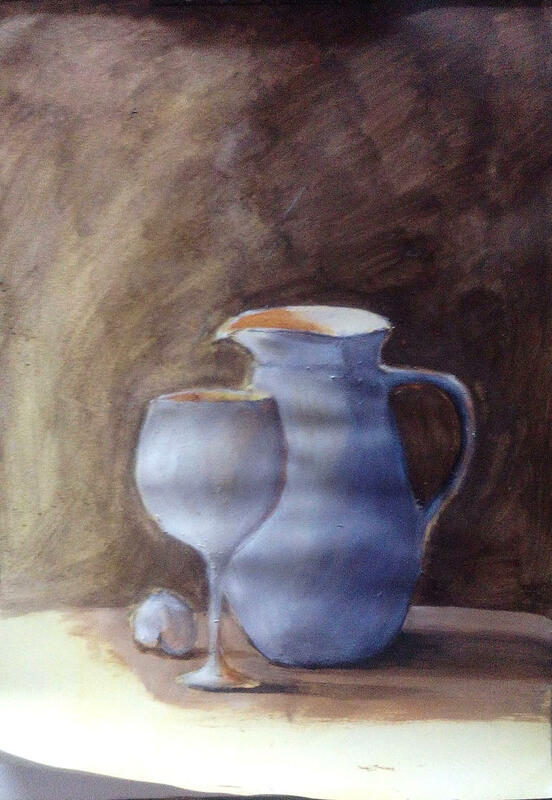 I don't know why, but a lot of of people including me thinks it is amazing to be able to draw or paint the impression of the inanimate objects we are seeing more than portraits or scenes. Maybe because only this genre allows the artist to build his own composition and arrange the elements all by himself unlike the portraits or the landscapes. Depicting an object to trick a viewer to think it is real but still - Hence, still life. Aftermath: A muddy or unreal canvas! Colours do not look right and did not turn out exactly as it was in our mind - not even close and harmony is far away! It turned into a visual cacophony! What might get wrong? A lot of things! But specially all those pretty colours you put at will! Beware of Green!Beware Of Green! Green is everywhere isn't it? Actually it's the most dominant natural colour you can see almost at every place of the world unless you end up in a dessert and don't count the cactuses. It's so fresh, so natural and it symbolizes youth - what's wrong with green? Well Everything! Green is a disaster. It's a very intense colour that you must use so precisely, otherwise you will ruin your entire painting. Ofcourse it's a complimentary colour but this is a complimentary colour that you should use less as much as you can. Green breaks apart the colour harmony of your paintings. Our brain is habituated to recognize many shades of green correctly because it's the most dominant colour in nature. And that's why a wrong shade of green can signal those knowledges "something is not right!" Even for a most inexperienced viewer. We all had those kind of paintings at some point, looking at which we felt something is not right – something is not right – But could not find it. What went wrong? We have put every finest details and all our patience in it. Then? Art has its own science. Science that makes a successful art – something that comes out exactly you thought of and leaves the same impact on your audience. That science is known as composition in art and music. Where your eyes will go at first, how you will draw attention, how much attention you will draw – these are not luck, but pure science. A well thought designed piece is always successful. So mastering the brushes are not enough, we have to learn about the basics that make a successful art! DISCLAIMER: The following article is a discussion on the characteristics of monochrome paintings. While discussing, I will go through a procedure of a monochrome painting. So you are free to take tips, tricks and ideas from the procedure if you like, but the article will not be considered as a tutorial or a teaching material. Monochrome paintings are considered to be the avant-grade paintings. It is indeed hard- to establish all the values with a single colour. But moreover, what makes it so special? What makes it top class ? Because working with monochrome is playing and experimenting with the lights and values - that takes artistic courage. Almost all the artists have few monochrome paintings in their life. These are like the stages or better said evidences of their artistic maturation - far away from the overwhelming colours, seeing the truest form! In the last article, I talked about painting knives and the differences, and how to get accustomed with the technique. You may refresh the memory of the old lesson here Painting With A Knife! Those were all the theories and tips. This time we will get to the actual thing — How to paint with a knife! Realism is a long-discussed topic, which has yielded in different opinions and views and genres. But by the science of art, a real painting is what depicts the reality around it ― the real physics! A lot of beginners have a misconception about how real a painting looks. All paintings are real, theoretically. They exist ― hence, they are real. But that is not the point though. But, everyone tries to replicate hyper-realism. Why? An impressionist painting does not look real enough? What is the definition of real? Painting With A Knife!Painting With A Knife! You all may have seen those old masterpieces – painted in impasto techniques with rich and bold use of thick coats of colours and you have wondered how on earth they could do that. So lets take a peek in the old masters' tools and techniques. Today we will talk about a less used traditional technique – painting with a knife. Though it's a second most famous technique but not much artists use this technique. Painting with a knife results in excellent textures, helps in bold application of thick rich colours, and, gives a whole new different level and style to your paintings. Painting knives are very useful in impasto technique – both in acrylics and oils. Besides interesting textures, this certain tool gives you more control over paint and opens up a lot of ways to experiment. In one sentence, painting with a knife brings up your painting styles at a new height. The photo does not do justice. How many times you have read or typed yourself such notes in artist’s comments, under traditional artworks? You’re not alone; digitizing our drawings, paintings, sculptures and other traditional, hand-made artworks can be tricky. Of course the work is never exactly same when changing it from a concrete object to a picture on a screen, but a lot can be done to achieve as representative result as possible! This is the first part of a basic guide how to make your traditional artworks look appealing when presenting them in the Internet. This is not about changing or manipulating your traditional artwork to something it is not originally, but helping you to make it look as good on a screen as it is in real life. This Part 1 introduces scanning and photographing tips. The Part 2 advices how to edit the scanned/photographed artworks. This is the second part of a basic guide how to make your traditional artworks look appealing when presenting them in the Internet. This is not about changing or manipulating your traditional artwork to something is not originally, but helping you to make it look as good on a screen as it is in real life. This Part 2 advices how to edit the scanned/photographed artworks. This guide is meant especially for beginning artists but maybe also more advanced artists can find something new to think about – or maybe you can share your best tips in the comment area of this article! I use lots of watercolors in my mixed media works and people once in a while ask me how do I paint backgrounds so that objects or characters do not get painted at the same time. I often just paint background around a character quickly with free hand, but if I want to be more precise and when there are lots of jagged edges or tiny details to go round, I use masking fluid to protect those. Here is a little tutorial how I use masking fluid in my mixed media works! You can use same tips in your pure watercolor artworks – the fluid still works similarly. Masking fluid is a handy tool if you want to leave some areas unpainted when painting with watercolors. It allows you to paint freely over the masked areas so you can avoid painting around complicated characters – instead you can just paint over them. This article is to give some handy tips and tricks for blending with alcohol based markers (Copic, Pantone, Tria, etc). The majority of the article is demonstrated using Copic markers, but the techniques used can be applied to the different marker types. Bleedproof / Bleedfree Marker Paper - 70 gsm paper which is thin and has a right side and a 'wrong' side, often comes in pads of 50 sheets and is quite cheap. Manga Drawing Pad - 250gsm paper which is thick and textured, often comes in pads of 10-20 or as single sheets, can be expensive. Japanese Manga Paper - thick, but smooth, more designed for inks and screentones, but can be used for colour pieces. There have been many articles written about this subject, but my article today touches on something a bit different: communication and its difficulties, and how to overcome them. PE: Free + Open Source Art ProgramsThere are plently of art programs out there, but many cost money to buy. This article aims to help you find a free or open source altneratives to paid art programs. Here are 10 ideas to try to have more fun with color in your art! All the examples used are works by the members of the Deviant Art community. 1. Make your OWN color wheel. Use only primary red, yellow, and blue to create all the shades by color blending or using premade colors depending on your preference. Using your own medium to create your own reference will give you a realistic spectrum of the colors you have at your disposal. 2. Create contrast with complements. Animation is the illusion of movement created from the quick sucession of static images with minimal differences between them. Today there is a great variety of animation techniques that include traditional animation (a sucession of frames, drawn digitally or traditionally), stop motion (photographs of real life objects), 3D animation (created with computer software), rotoscoping (tracing a live action sequence, frame by frame) and a large etcetera. The Digital Art > Animation gallery is intended for animations of all kinds, as long as they were made with digital mediums and they're NOT in Flash or video format (usually in GIF format). Not every camera has the option to use RAW, but many do and I highly suggest you use it! I shoot in RAW about 90% of the time. Shooting in RAW retains all the data on the sensor, and doesn't compress it, unlike JPEG. This kind of file is a lossless format. If you have a question, please comment below! Hopefully this has helped you. Whilst these ideas are not unique or special to anime and can be used in other styles, the focus of this article will be the anime style. Clothing is a diverse topic that has a lot of shared principals that can be used. The fibres that are used to make up a fabric sample are diverse and can be used to make a number of different fabric types. Using a simple search for a type of fabric yields hundreds of images that give you an idea on how it bends and folds and flows. Mix of polyester and cotton, leather, silk, cotton, polyester-cotton, polyester spray jacket. They all have different fold patterns and interact with the light source differently. The leather, silk and spray jacket are quite shiny on their ridges. The hoodie and t-shirt have less rigid folds, whilst the cotton shirt has sharp angles. From the time a budding artist drags their first waxy crayola across a piece of construction paper the artist is bombarded with one question. "What is it?" Artists have many ways, media, tools, and tricks in their toolbox to help them convey the story being told in their artwork. The human eyes and brain look for the subject of the art: the person, place, or thing that makes it important. Brains make sense of the art we see by dividing the work into negative and positive space. 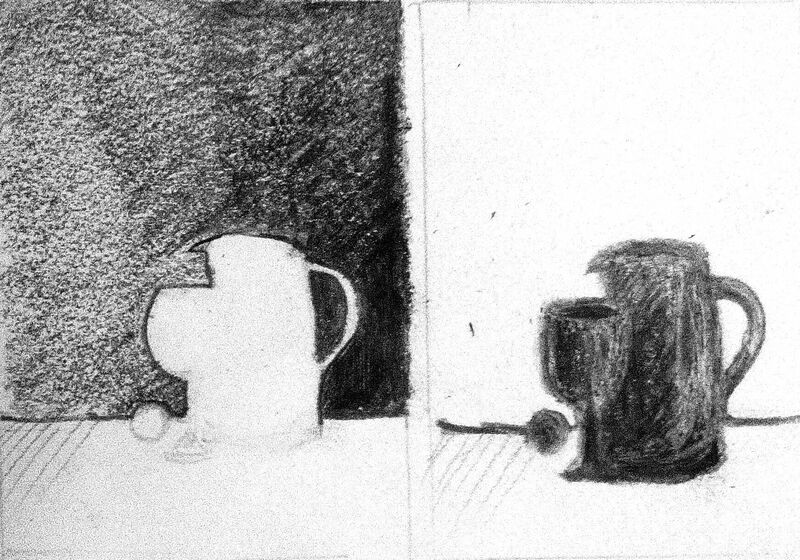 In a traditional pencil drawing dark lines are used to create the "What is it" also known as positive space and the white background becomes the negative space. A small amount of attention paid to where and how negative space is used can have a huge impact! All the examples used are works by the members of the Deviant Art community. Would you like to decorate your page with fun little figures - so called pagedolls - but you're a traditional artist and don't know how to make background transparent behind those dolls? If the answer is yes, then this is a guide for you! When drawing pagedolls digitally, getting them on transparent background is quite simple – just do not draw any but leave the pixels behind the figure untouched. When you have drawn your pagedoll on a paper, it requires a bit more effort to remove the paper white behind the figure, but it can be done easily with couple of steps. This tutorial advices gives you step by step guidance for transparent background. In this tutorial the used program is Gimp. Gimp is a free photo editing software, which you can download it here http://www.gimp.org/. Of course you can use any program you have available, as long as it supports layers and transparency. So, what is Illustration & what do Illustrators do? Illustration is: commercial art! That means an illustrator is an artist who does work for money. They take on commissions and follow briefs set out by their clients to create a piece of work with a purpose. Illustration is: storytelling! Book covers, movie posters, CD/DVD cover art, graphic novels, children & picture book illustrations, magazine & newspaper editorials, concept art, character design & storyboarding all fall into the category of illustration. Illustrative art is art with a narrative element, so a piece can either be one stand alone image or run as several in a cohesive set. What if your work doesn't involve art? I am a geek by trade, part of a Systems Test group at Xerox. My work does not directly involve photography in the least. However, since 2010 I have maintained a personal gallery in a large area of wall space in our building, as well as having photographs scattered about elsewhere. If you're looking at a contract that's terrifying you or involves a ludicrous amount of money or whatever, please consult a local lawyer in your jurisdiction who can help you more directly. This is an article intended to gloss over standard creative contracts from the perspective of a contractor/employee and an employer, and to try and make you realize why you should probably use one - plus a few tips I've learned over the years on both sides of these contracts. Now buckle up and enjoy the read.